This exquisite 1961 Jaguar XKE chassis number 875073 started its life on June 1st, 1961. It was then shipped to New York, USA to be delivered at Jaguar New York as a street car. Not long after starting its life, this XKE went from a street car to a dominate force on the race track. Throughout its 50+ years of racing, it has won several events throughout the world, it was even recognized at Monterey 50-year E Type anniversary. To this day it is still able to be seen at race events around the world. In recent years the engine underwent an extensive rebuild, done by legendry Jaguar engine builder Bill Terry. During that time the engine was bored out to a 4.0 liter mated to a 5-speed manual transmission and Dyno tested for a rating of 338 horsepower at 6,300 RPM’s. The 1961 Jaguar XKE is one of the all-time icons of the motorcar world since being introduced in 1960, proving to be deserving of all the accolades, the “E Type” took the world by storm. In 2004 they were rated as the number 1 sports car of the 1960’s by Sports Car International and racked first by The Daily Telegraph in a rating of the “100 most beautiful cars” of all time. Even Mr. Enzo Ferrari himself said in 1961 that the XKE “the most beautiful car ever made”. The XKE is not only a pleasure to drive on the track or street but also a pleasure to just look at. This XKE retains all lighting needed to be street legal but has served its life as a race car. The engine was built by legendary engine builder Bill Terry in 2013. At that time Mr. Terry bored the engine to a 4.0 liter installed new cylinder sleeves, Arias pistons, Bauer competition connecting rods, Weber carburetors, Holley fuel pump, Mallory ignition, Mallory distributor, three stage dry slump oil delivery system, external oil pump, Quarter Master racing clutch and many more upgrades were during that time. In 2011 the interior was sent to BAS Limited to have center console and seat reupholstered. Doors, moldings, sills and many other interior parts were replaced by Donnybrooke Motorsports. Donnybrooke Motorsports also extensively went through the undercarriage and installed a new Billet steering rack, steering bushings, racing brake pads, front sway bar, inner and outer wheel bearings, axle seals, rebuilt drive shaft, strengthened chassis, and much more was done at this time. 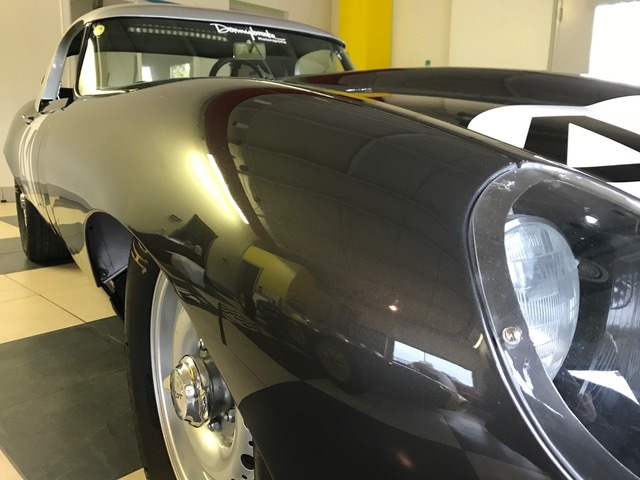 The paint is a factory Opalescent Gunmetal with a slightly deeper tone as was on the vehicle when it was delivered at Jaguar New York on June 22nd, 1961. It remains in good condition with some minor paint imperfections that do not take away from its exquisite beauty. The doors and bonnet have been replaced with alloy parts to help save weight. The vehicle does come with original hood if buyer is interested. Also comes with period correct knock-offs, racing wheels, and exterior lighting. Hoosier racing tires come equipped to help keep this powerful race car on the track. 24,497 miles shows on the odometer, which is believed to be correct. Being a race car most of its life mileage cannot be confirmed. If any questions, or would like to acquire about this XKE, feel free to contact Logan at Donnybrooke Motorsports at 952-471-0072.